In South Africa, students doing grade 12 are not called “seniors;” they are called “Matriculates.” This is because at the end of 12th grade, the students take their Matric exams. This is a nation-wide standardized test that similar to the ACT or the SAT that we take in the states, except that it not only decides your eligibility to college, but also if you pass 12th grade as a whole. You could have straight A’s in class, but if you fail your Matric exam, you have to take the whole year over. With that in mind, I will tell you that Matric is a BIG DEAL. In this part of the country where education has many problems and is sorely lacking, it is a big deal to even make it to your Matric year in high school. For those who do make it to Matric, it is a great achievement and one that students are very proud of. So when I was asked a month or so ago to be a “guest speaker at an upcoming event,” I didn’t realize that what I was actually agreeing to was to be the guest speaker at this year’s Matric Tie Ceremony. 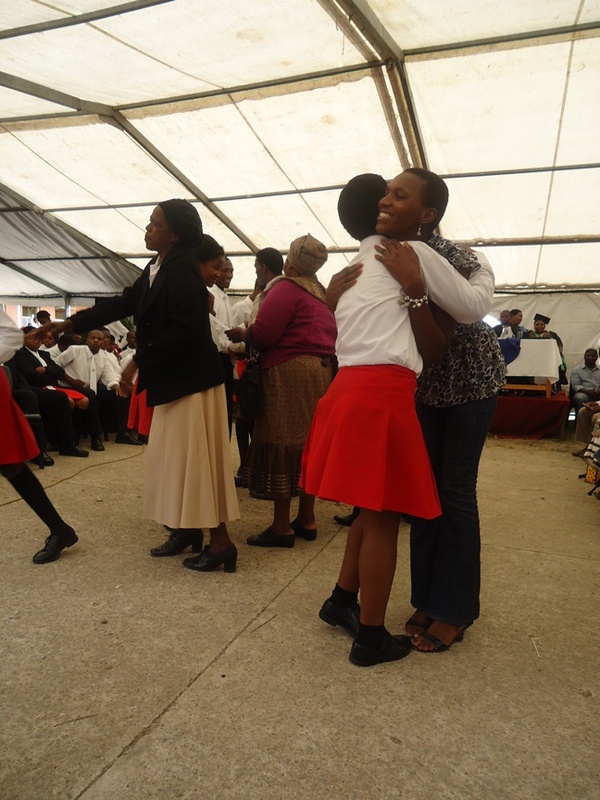 This is a ceremony that happens at the beginning of the year where all of the Matric students are given their special Matric ties. 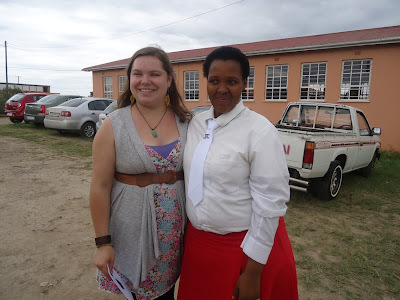 Their ties are different from the other students (keep in mind that all schools are uniform-wearing) and they say their school name and MATRIC 2012 on them. Each tie is placed around a student’s neck by a parent, aunt, sibling, or family friend. The purpose of the ceremony and of the ties is to motivate students to keep working hard, to congratulate them on their success, and to serve as a constant reminder to those students that they are the example now. People keep these ties even after they are out of school the same way that people in the States keep their tassels from graduation. Because many of the students who start their Matric year don’t graduate and because students do not find out their Matric exam marks until after the school year is finished, this ceremony is, for all intents and purposes, the equivalent in scale and importance to a high school graduation ceremony in the States. When I found this out (after I had already agreed), I kind of panicked. BUT… I had plenty of time to prepare and my speech went over very well, if I do say so myself. The ceremony itself was an occasion to be reckoned with. There was singing and dancing and food and a DJ. There were proud parents and family members and all of the students from Nozuko (plus some students from neighboring schools). It was loud and raucous and joyful and, unlike US graduation ceremonies, it was not at all dull. It went on for hours, but it was so entertaining that no one seemed to mind. I was so honored to be asked to speak to these students and also very aware of what it would mean to them to have someone from overseas as their guest speaker. For them, it was something extra special and prestigious even though I see myself as an average Joe. I hope I motivated them and I hope that my words didn’t go in one ear and out the other. However, if they did, I’m still glad that I could make that ceremony something even more special for the Nozuko S.S.S. Matriculates of 2012. Here's a short video recap and some pictures for you all. Enjoy! 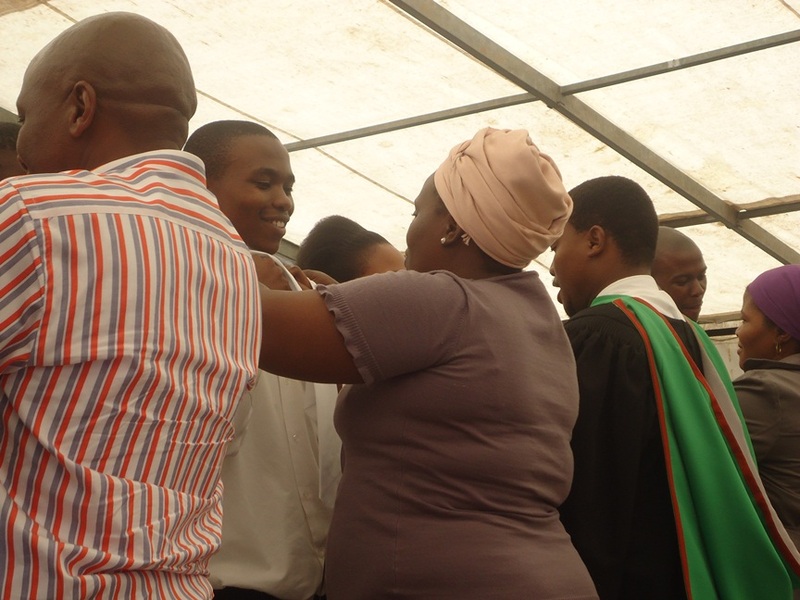 Proud parents/aunts/uncles officially bestowing the Matric ties. A newly "tied" Matric student! I found that some of the things they said and did really irritated me at first because they were missing the point completely. The more I thought about it, though, the more I came to realize that many of those things they said and did were things that I too said and did in my first few weeks/months here. On the surface the place does look incredibly hopeless and, from a distance, it sometimes looks like what we do there has no impact. It’s only been in getting to know this place and these people and this culture that I have been able to see a clearer picture of the dynamics of Itipini. It’s only because I have had time that I understand (or at least am beginning to) the ways in which the Project is working in subtle but long-lasting ways. In a single example, we only have five TB patients right now. Less than 5 years ago, there were 20 or 30 at any given time. Our current 5 patients are also after a group of nurses came in from the municipality last month and went door to door to all the shacks and tested everyone they could. 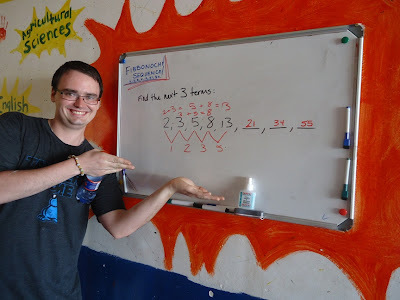 An old volunteer, Jesse, used to make daily rounds to administer shots of Streptomycin to all the TB patients who couldn’t make it up to the clinic because they were too weak. Today, we have no patients on Streptomycin which is what they give you when you have a really severe case of TB. So not only do we only have 5 TB patients, but they are all generally mild cases. 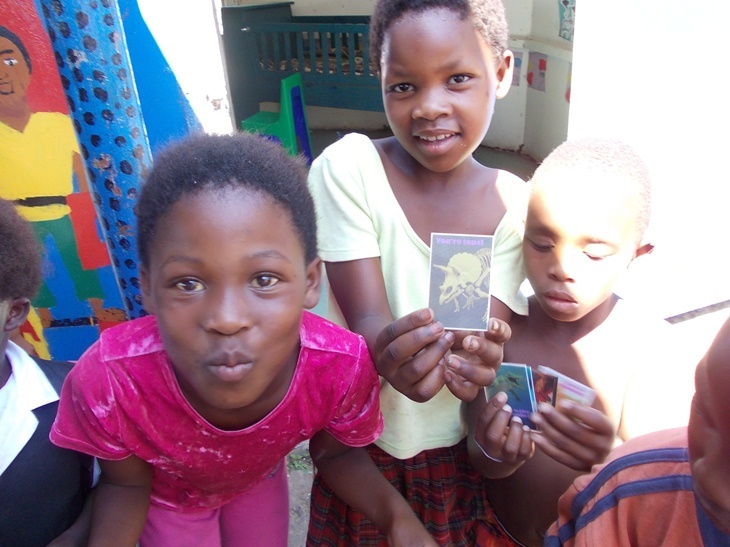 In summation, because of the patient and diligent work of the clinic, there is very little TB left in a place where it used to run rampant. I think many people, especially Americans, are always very anxious to see immediate results. We feel fulfilled if we can see the fruits of our labor quickly, quantify the outcomes, and recount them to others. Real progress, however, is something that is slow and organic. It is something that is less ‘problem and solution’ and more ‘transition period’. It is something that takes time to grow and time to form. Real progress is also something that you can’t always see when you’re in the midst of it. It’s not something that can be boiled down into numbers and figures or fleeting moments of instant-gratification. It is not something that HAPPENS, but rather something that BECOMES when a group of people work and live together. Real progress is always two steps forward and one step back and is always, always endless amounts of patience and perseverance. Real progress starts by really listening to what people are saying and by really seeing what is going on around you. 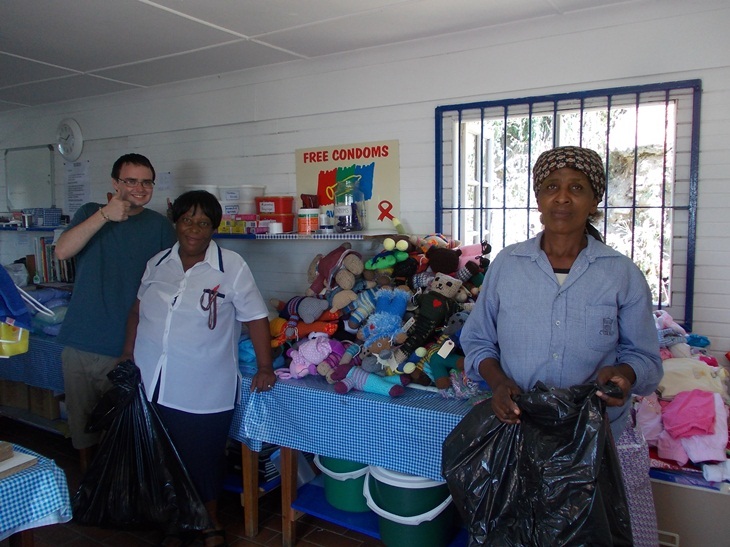 Jeff, Sister Dorothy, and Mrs. Twala with an entire counter full of medicines, supplies, bears, and blankets! 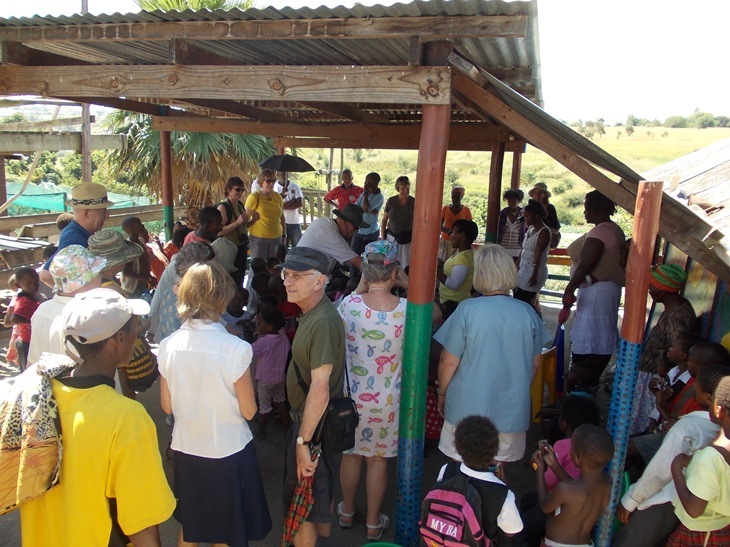 The veranda packed with visitors and excited children. 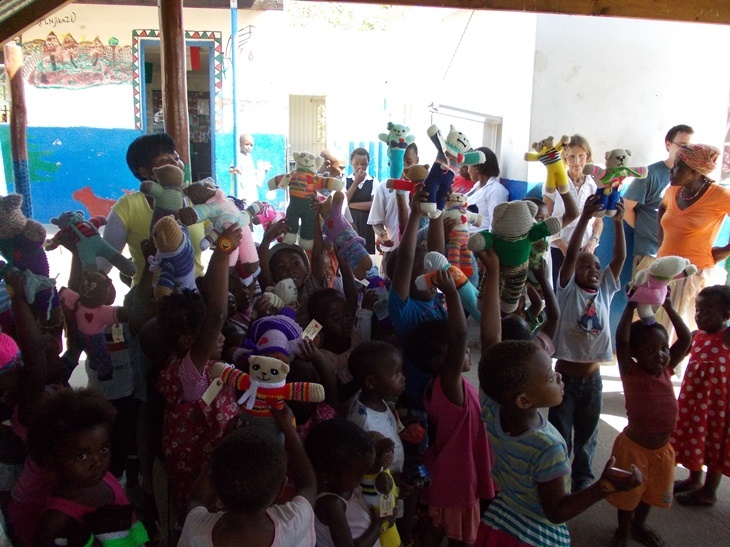 Handing out the crocheted bears. 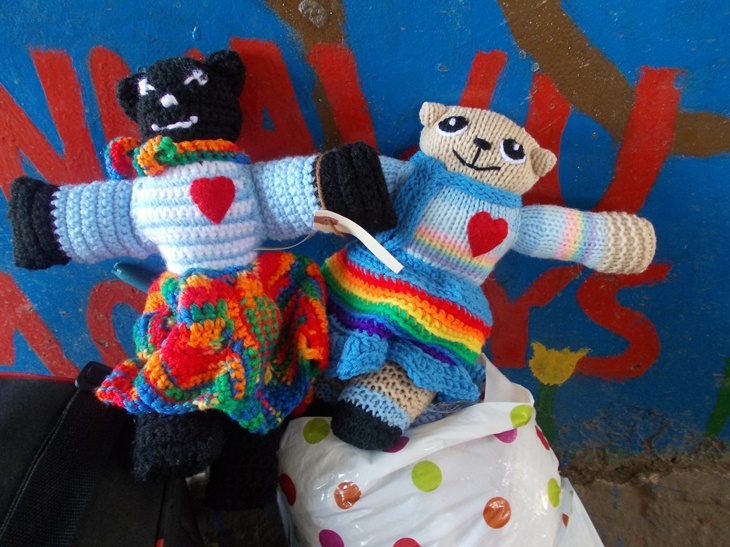 The world's most adorable crocheted bears. The kids and their new bears! For the past two weeks, I’ve been able to enjoy the much missed company of my boyfriend, Jeff, and it was marvelous. 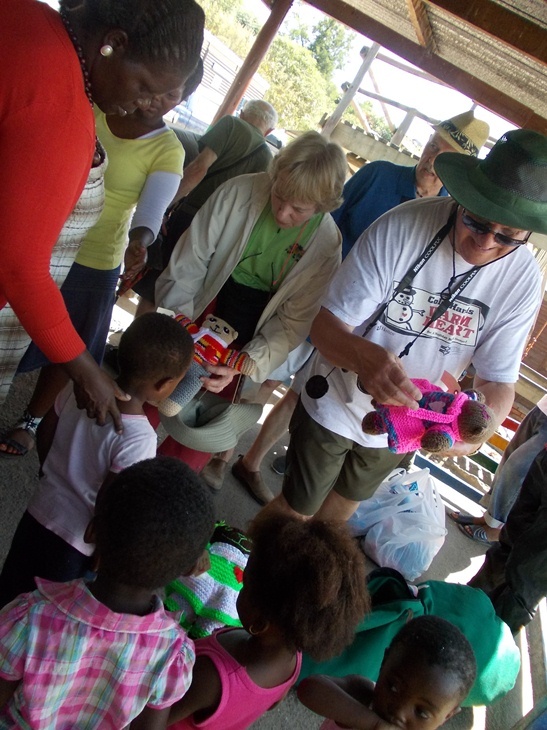 We worked hard at the clinic and beyond and spent as much time as we could exploring Mthatha and the Wild Coast. 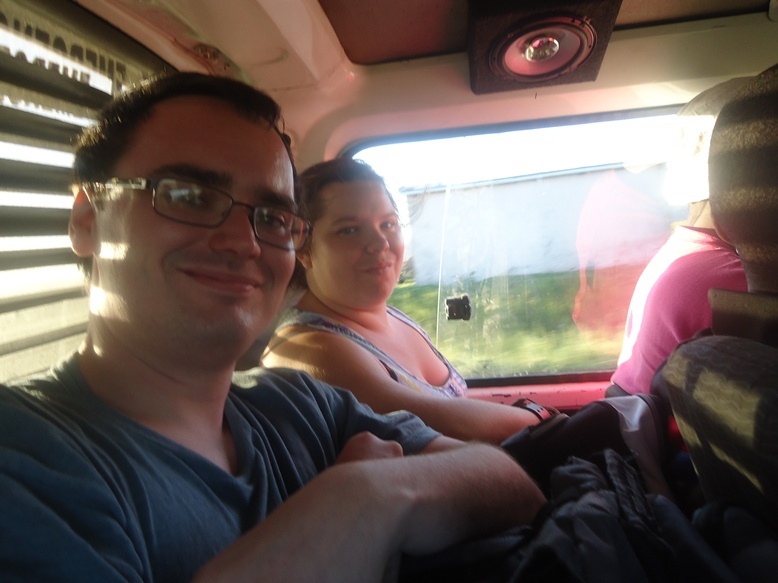 I feel like it was the most intense two weeks since I’ve been here, but we could have done nothing and I would have been happy just to have his company. This way, though, we got to enjoy company and adventure! 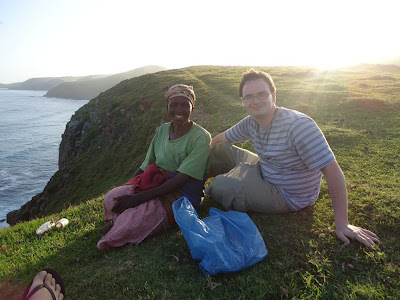 I am so thankful that he had the chance to come out and see Mthatha, Itipini, and the Wild Coast first hand. These are things that, no matter how much I try, I can never really explain to people and I’m glad he got to experience them. That we got to experience them together. It's the vitality of shared experience that really makes the entire thing worth emptying our bank accounts to make it happen. It was also really nice to feel like I was home again. Just having him around reminded me of all of the things I love about Oklahoma. So (before I start getting to sappy), I’ll end by summing it all up simply: It was a GREAT last two weeks! 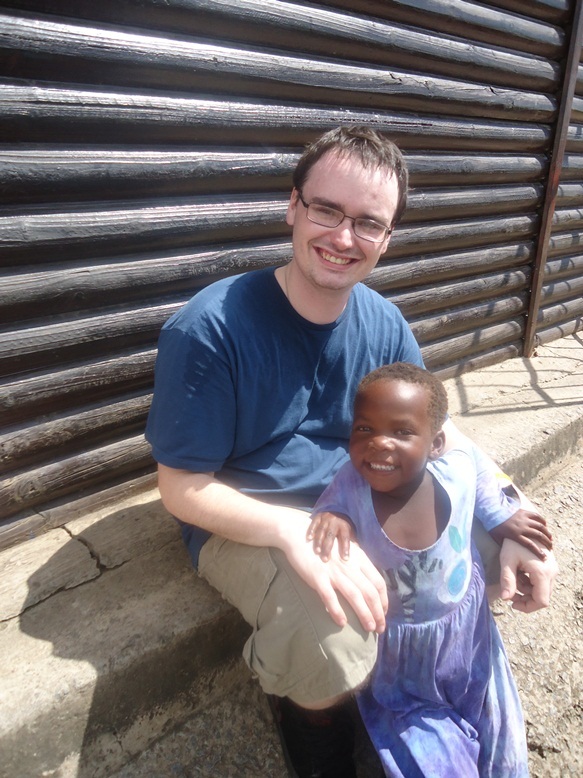 Jeff made quick friends with the Itipini kids which called him uJesu which means "Jesus"! 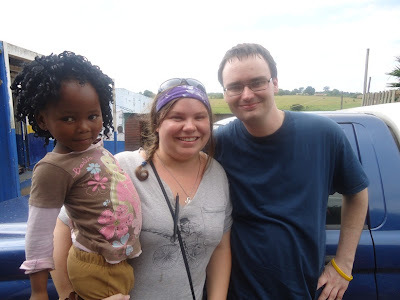 I let one of the kids use my camera! 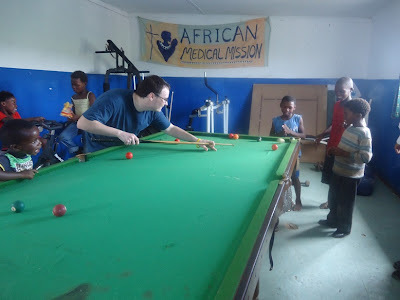 Shootin' pool with the boys in the Itipini rec room. In the minibus taxi on our way to Coffee Bay - right after I threw up out the window. Twice. Jeff and Nolitile, a Xhosa woman from the area that was walking home and stopped to come and join us on the grass just to chat. Between her broken English and my broken Xhosa, we managed to have a really nice conversation. We were working with number series in tutoring and Jeff got really excited when one of the series they were supposed to solve was the Fibbonacci Sequence! 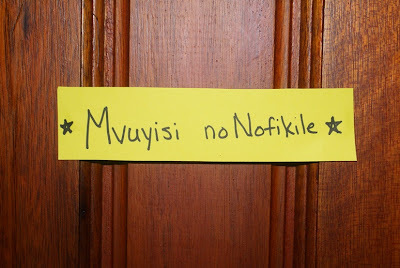 This is the sign that we put on our door the first night he was here. 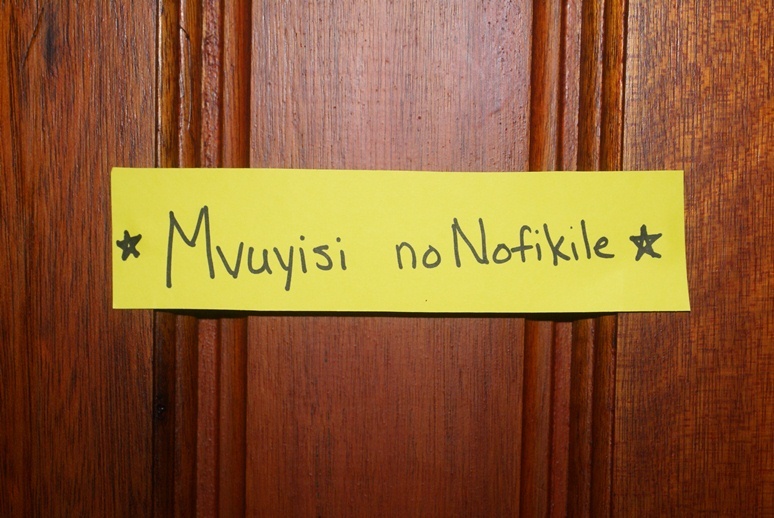 These are our Xhosa names: Mvuyisi (Jeff) means "bringer of happiness" and Nofikile (me) means "I have arrived" (the "no" inbetween simply means "and" or "with").